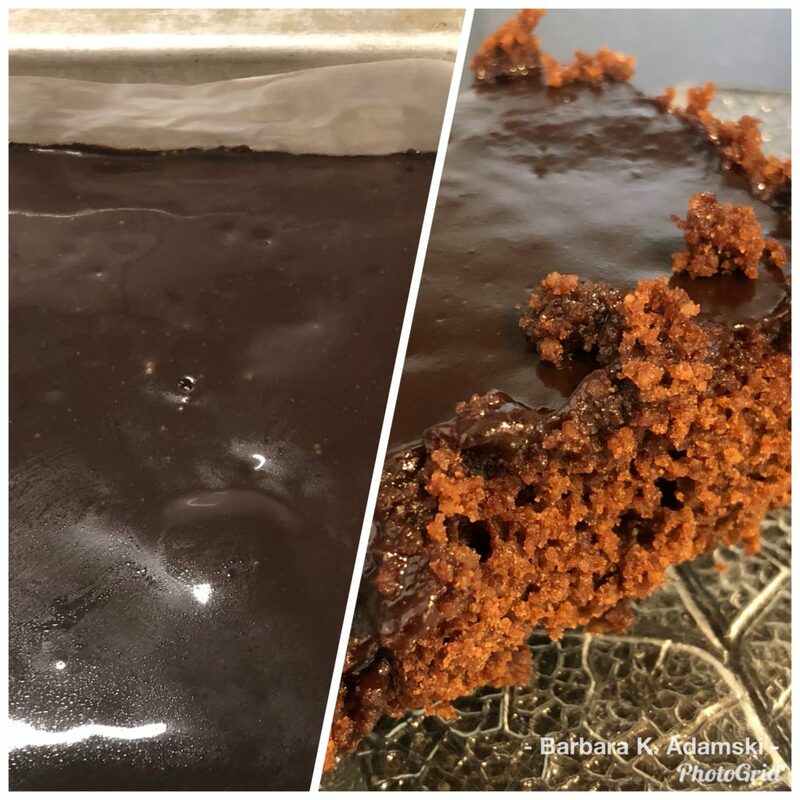 I created this recipe when I wanted to bring a dairy-free, gluten-free dessert to a dinner party, so my daughter would have something to eat while the rest of us dug into an ice cream cake. Because another guest was vegan, I figured I’d make it vegan as well. A quick Google search led me to this “Foster cake” recipe, which, as you can see, is in no way gluten free. Being a notorious non-follower of recipes, however, I didn’t worry about substituting a few ingredients and playing around a bit. I subbed almond flour for the matzo meal (but note the difference in amount), cut the sugar, and used coconut milk instead of almond milk because that’s all I had on hand. The version I took to the party was a slightly sweeter version of what I have below. General consensus was that the cake was great (reminiscent of a McCain’s Deep and Delicious) but could even be a tad less sweet. If you have a really sweet tooth, though, feel free to add more sugar. I like just a subtle sweetness to my desserts, so I’m sticking with this revised amount, which is 50% less than the original recipe. •	Line an 8-inch square pan with parchment paper. •	In a large mixing bowl, mix all of the cake ingredients until smooth. Pour into pan. •	Bake for about 30 minutes. Insert a toothpick to check for doneness. If it comes out clean, it’s done. While the cake is baking, make the glaze. Add the glaze to the cake while the cake is still hot. •	Put all glaze ingredients in a small saucepan. •	Cook over medium heat until smooth and sugar is dissolved. •	Pour the glaze over the cake while the cake is still hot. •	Let the cake cool to room temperature. It’s not often a cookbook review is life-altering, but Fine Cooking’s review of Japanese Soul Cooking (by Tadashi Ono and Harris Salat) a while back nudged me toward purchasing what I consider the best cookbook I’ve ever owned—and I’ve owned many. Soul Cooking has put an end to that. The book has all of my favourites and a few new things as well. I had no idea that making ramen is such a fairly complicated process, what with the stock and the marinated eggs (which happen to be the best part!). The first time I made ramen, I made the shoyu ramen, and I encountered no glitches. The second time (when I made shio [salt] ramen for my daughter’s birthday dinner), I accidentally drained the stock right into the sink. I tried to recover the meal by creating a less elaborate stock, but got completely distracted with the rest of the recipe and ended up adding way more salt than necessary. I’m going to try this again (mostly because the eggs were so good), but will likely save it for a time when I am alone in the house and can fully concentrate. Making home-made gyoza (potstickers) is a rather time-consuming process, but the resulting product is so worth it. The instructions are very detailed and accurate, and the photos showing how to fold the gyoza help immensely. I just loved the way the other ingredients complemented the tomatoes in this one. I have only made it once, though, because my husband doesn’t like onions and you can’t really hide them in this recipe. Still, if you have garden-fresh tomatoes around, this recipe rocks. I make the potato korokke (croquettes) quite often and even make extra for the freezer so that I can deep-fry them at a later date for a quick meal. The korokke recipe is one of my favourite recipes in the book. Don’t let the name fool you, these korokke also contain pork. I haven’t tried the curry-rice recipe yet, but that’s on my to-do list. While the kani (crab) cream korokke were good, they’re a bit more complicated to make and my family doesn’t like them as much as the potato ones. Tastuta-age (what I know as chicken kara-age) is the dish I cook the most. It’s the reason I always make sure I have chicken legs and katakuriko (potato starch) on hand. While it sounds like a cumbersome dish to make, it’s really very quick and easy. My husband hates potato salad but loves this, so it’s pretty much the only potato salad I make now. What’s different about it? Thinly sliced cucumber, carrot, and onion are lightly cured in salt before they get added to the cooked potato. (The onion hater doesn’t even complain about the onions.) When I make this salad, sometimes I go with the original recipe; other times I add a bit of yuzu koshou (a citrusy chili pepper condiment), which really spices it up. Either way, though, this salad is great. The Japanese version of Salisbury steak takes the humble meal to a whole other level. The soya sauce adds that touch of umami, and the milk-soaked panko makes the burger almost melt in your mouth. I’ve even served these with a side of perogies for a Japanese-Polish fusion meal. To be honest, I don’t recall what this tasted like, but I remember that we all loved it. (This actually surprised me because I expected a few complaints, for some reason.) You can use any mushrooms for it (except portabella). Thumbing through this cookbook again, I realize there are so many dishes I haven’t tried. I also realized that they have a recipe for hiyashi chukka (cold Chinese noodles), which we called “reimen” in Osaka. (That’s probably why I didn’t notice.) 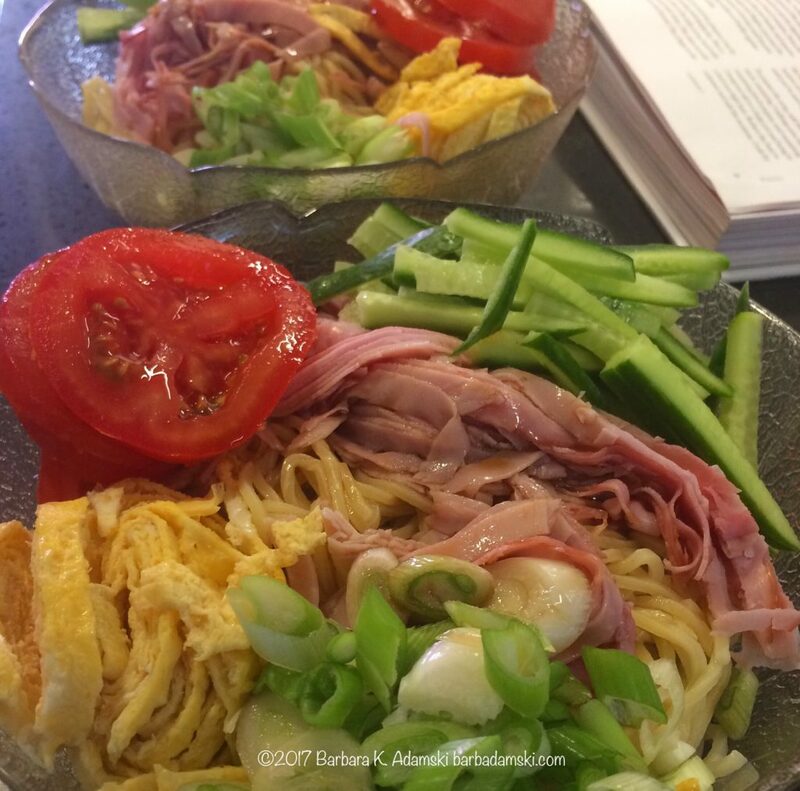 Reimen is my favourite summer dish and I occasionally do make it here in Canada, so I’m looking forward to trying Ono and Salat’s recipe. I’m publicly committing to a new goal: to try every single recipe in this book. Wish me luck! Although I’ve read the books and have Konmari’d all my stuff (and a lot of our common-use items), I might get this book so that I can, you know, leave it around for others to pick up at random. Last week, I took a workshop in Scratch, an MIT programming language that helps young people (and folks like me) create interactive stories, games, and animations. It was a lot of fun, although I realized early on that command-Z is not the friend that it is in other software programs. I got into all sorts of messes while experimenting, forcing me to start from scratch more than a few times. Below are a couple of my creations. I did not draw the backgrounds or any of the features. What I did was program (in a WYSISYG sort of way) the actions and sounds. Check out Scratch, if you can. And if you have kids, definitely sign them up. It’s free and secure and will get them into the mindset of programming, which will help them in their digital futures. Sometimes virtual reality is more fun! My more recent bee experiences have been with the gentler, solitary kind, the mason bee (from the genus Osmia). Mason bees produce neither honey nor beeswax but play an important role in the pollination of our flowers and fruit trees. In fact, mason bees are such efficient pollinators, it takes just one mason bee to pollinate 12 pounds of cherries, while it takes 60 honey bees to do the same! 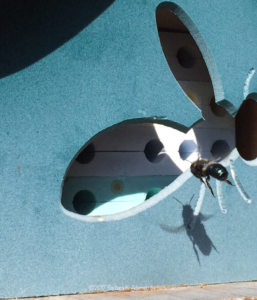 Mason bees seem rather unbeelike, actually, especially when you first meet them. For one, they don’t live in hives. Mine nest in a little bee house with a shingled roof. Inside the house are cylinders formed by stacking trays, where the female bees lay their eggs. These cylinders can also be paper straws or tubes. While drilled-out wood is also possible, it’s much easier to use the trays because you can separate them for easy cleaning in the fall. In the natural world, mason bees nest in hollowed-out twigs or the abandoned nests of beetles or other critters. “Although there is a bit of an industry around mason bee houses, as long as the right kind of plant material is available, the houses aren’t entirely necessary,” says Queensborough resident Douglas Justice, who’s also the associate director of horticulture and collections at the UBC Botanical Garden. He does add, however, that the houses are “great for clean freaks and balcony gardeners.” I personally love using the store-bought house because it lets me become a part of the bees’ short lives and keeps me more attuned to the season, the weather, and what’s happening in my garden. Most mason bees don’t look like “normal” bees. In fact, they’re actually rather fly-like. The kind I think I have, Osmia lignaria (orchard mason bee), is a sometimes bluish-black creature that is native to the west coast. Why do I just “think” I have Osmia lignaria? Well, while I initially bought Osmia lignaria from West Coast Seeds a few years ago, my bees have likely been joined by different types over the years. This year, the few bees I’ve noticed hanging out around the bee house were much bigger than those of previous years. Two were quite black and the other was a more typical yellow and black stripe. Not into keeping bees of your own? You can still help the bee populations and support their pollination and honey-making efforts by planting some flowers of your own. A number of bee- friendly plants do well in the Lower Mainland, for example, lupine, lavender, fuchsia, and creeping thyme. Bees are attracted to both the colour and the smell of flowers, so a variety of both will keep them busy and happy. 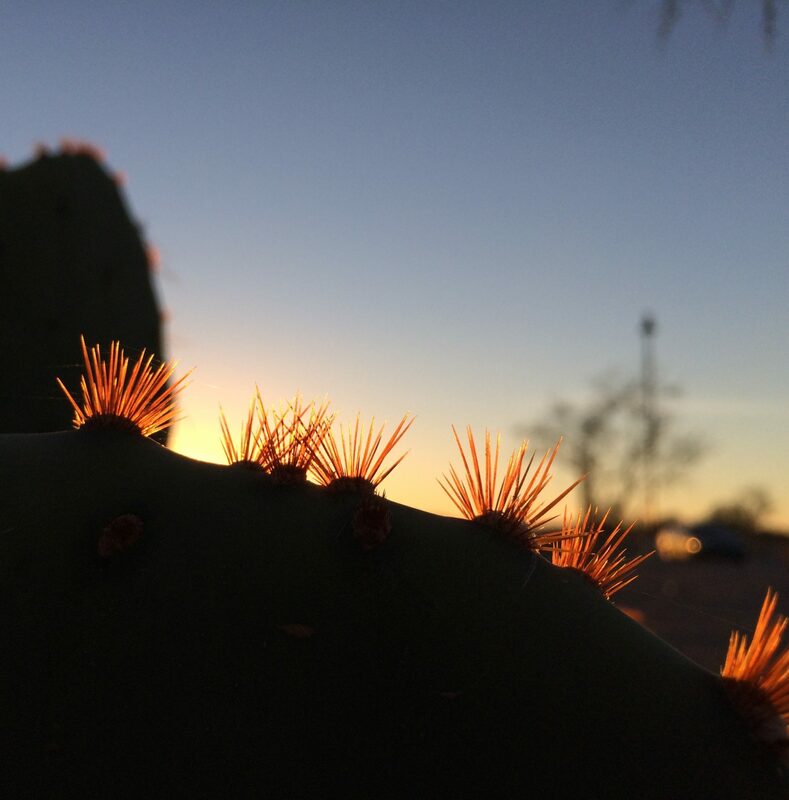 Bees also prefer native plants to exotic imports. In fact, the humble dandelion will attract more bees than a fancy, multi-petalled rose. What’s more, hybrid ornamentals provide less pollen and nectar, largely because they were bred for larger or showier owers and not for pollen or nectar production. But sometimes even that much effort is not required. Check out Feed the Bees for tips on creating your own bee-friendly garden, and visit Crown Bees for information on keeping mason bees and Urban Bee Network for info on keeping honeybees. Only female bees can sting. Honeybees are related to wasps and ants. Honeybees exist on every continent but Antarctica. Male mason bees always emerge first, often within half an hour of your setting out the cocoons. 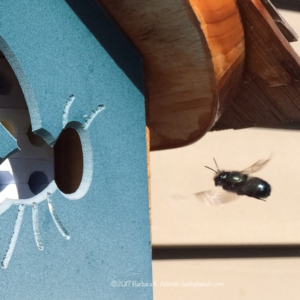 Each female mason bees nest in her own tube, which her pheromones help her identify. Antennae are one thing that distinguishes mason bees from flies. You can tell male mason bees from female ones by the white hair on the males’ heads. “Primary” colours for bees are blue, green, and ultraviolet. Other colours they experience as combinations of the three primary colours. They cannot see red or, rather, they experience red as black. The bee’s stinger is really an egg guide. 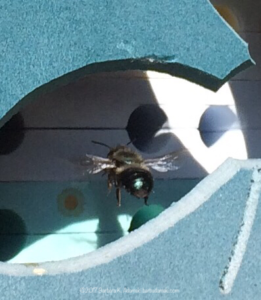 Mason bees get their name from the fact that they build mud walls between individual eggs. *A slightly longer version of this story first appeared in Tenth to the Fraser and still appears on their website. For cool New West-based stories, go check out their site. If there’s one dish that makes me think of the time I spent in Japan, it’s takoyaki, tiny dumplings with a chunk of octopus and a few other things inside. Takoyaki was invented in Osaka, the food capital of Japan, in the 1930s, by a street vendor named Tomekichi Endo. In the beginning, takoyaki was street food for me, something I’d find at an Osaka matsuri (festival). It soon became my favourite après-ski food, far better than the pizza pops of my youth. And when I lived a few doors down from a takoyaki shop, it became a staple in my life, so much so that when I moved to a different neighbourhood, I bought myself a takoyaki maker and learned how to make the dish myself. I made a slightly westernized version, using homemade chicken broth instead of dashi, and sometimes veered from the traditional octopus, adding cheese instead (inspired by the shop in my old neighbourhood). Takoyaki is a social dish, best made by a group of friends huddled around a kotatsu. I lugged the cast-iron moulds home with me when I left Japan, hoping I could recreate that experience in Canada, but I soon realized the impracticalities of hooking up a gas canister to the device in a Canadian apartment. Still, I was reluctant to part with the takoyaki maker, and stored it until my decluttering phase in 2015. It’s become more common here in recent years. In fact, I can now get great takoyaki at nearby Ikoi. But I still miss being able to make it at home whenever I want. 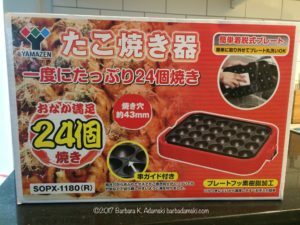 All that’s going to change, though, because the other day, my electric takoyaki maker arrived. Now all I have to do is source me some octopus and a few other ingredients, and get going. It’s a pity I no longer have my kotatsu. My new takoyaki maker arrived!